My parents in the Netherlands sometimes send me articles about cycling, thinking that I can use it in my cycling advocacy efforts here in Maple Ridge. I just received the latest one, a big, 2-page article in one of the national newspapers, the Algemeen Dagblad, with an interview with Saskia Kluit of the Dutch Fietsersbond (the national cycling advocacy organization). Nowhere in the world do as many people bike as much as in the Netherlands. Per resident they bike 900 kms annually. That's 15 billion kms per year. Everybody in the Netherlands bikes, not only the the working poor, but also former Queen Juliana and the Prime Minister. The French invented the bicycle (vélocipède), but the Dutch invented the bike path (fietspad), which was exclusively for the bicycle. After World War II the car rapidly gained in popularity. The number of traffic deaths rose significantly to 3,000 annually, and many of them were cyclists. But in 2013 there were 650 traffic deaths, 200 of whom were cyclists. Due to the increase in cycling, the number of deaths among cyclists increased. Many babyboomers like to cycle once they retire. E-bikes mean a lot for those over 60. They're a lot of fun, but they also help people with physical limitations to keep active. They offer freedom and independence. However, older people are more vulnerable and don't react as quickly as they used to, which leads to an increase in injuries. The Netherlands boast almost 35,000 kms of bike path. Volunteers have developed an on-line cycle route planner which allows you to plan your trip from door to door. In the Netherlands you can bike just about anywhere. Drivers and cyclists understand eachother, since many drivers also bike. The city bridge in Kampen has separated pedestrian and cycle paths. But cycling has grown so much that the government has to think about the next step. Some bike paths are being used by thousands of cyclists every hour. In the big cities, but also in national parks on the weekends and during holidays. So bike paths need to be widened, and the cycling network needs to be refined. Sometimes you need to dare to say: the bicycle is #1 here. Sometimes there's not enough support for the bicycle. Electric cars in the Netherlands presently number about 30,000, and are being subsidized by the government. Since 2009 1.2 million e-bikes have been sold, without any government subsidy. Sometimes cyclists are being asked to be very patient during road construction projects that go on for years, and cyclists get temporary routes that are not great, such as the construction around the Central Station in Utrecht, which has already lasted for 10 years. Presently a large banner tells cyclists that "Change is gonna come - the station zone is building a car parking". And nobody tells cyclists: "thank you for being patient". Lots of bike thefts are happening in the Netherlands: about 700,000 per year. Many people don't bike because they're afraid their bikes will be stolen. Saskia says: "Logistically, when the bikes of my two sons are stolen, it's a disaster. I have to drive them, give them money for transit, or let them use my own bike". The average Dutch person will choose the bike for one third of his trips. Saskia is on the Board of the Dutch Cycling Embassy, partners of which are the government, business and non-governmental organisations. They successfully promote the bicycle abroad, and there is so much interest that it's almost too much to handle all the requests for help. Take for example Uganda. There it's not just about mobility, it's also about empowerment. You can walk 6 kms, but in that same hour you can also bike 20 kms. Your world gets bigger thanks to the bike. In Malawi, nurses have been given a bicycle, so that they can provide services more quickly. The Dutch bike is special. You sit up straight. In many other countries people ride on more sporty bikes: mountain bikes, road bikes. Somes things happen abroad that make Saskia jealous. 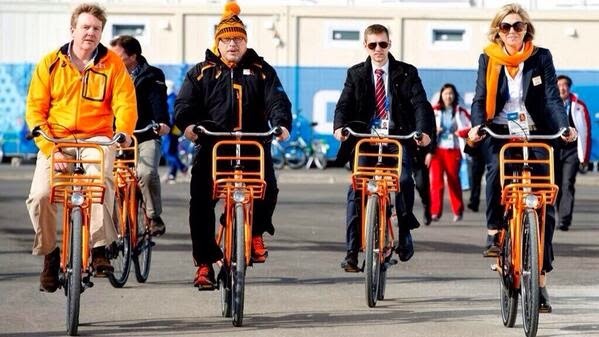 For example China, which is the third-best cycle nation in the world, after the Netherlands and Denmark. Some cities in south-east Asia have bike shares with hundreds of thousands of bikes. In Japan there's a system whereby your bike disappears into the ground; it's suspended in an underground storage area. When you pick up your bike two hours later, it's been nicely cleaned. In the Netherlands, we don't want to pay for that. We still have to win over a world in the Netherlands. For example, immigrants bike less. Parents remember the danger from back home in Turkey or Morocco, and worry about their kids in traffic. For immigrants, the car is often a status symbol. The bicycle isn't. So if you want to show your family that you're doing well, you need to put a big expensive car in front of your door. Kids in the Netherlands are the happiest kids in the world. The difference is the bicycle. Saskia sometimes talks to parents who drive their kids to school. She says it takes away the opportunity for these kids to have more independence and to be proud of themselves. Parents think that traffic used to be much safer. However, when today's parents were growing up, three times as many kids were killed in traffic. It's never been as safe as it is now. Bike accidents always make the news, but the media of course never write about all those millions of people who made it to home safely. The advantages of cycling are well known. It's good for the environment, although only one in every 10 cyclists gives that as a reason for cycling. The bicycle is fast, cheap, comfortable and healthy. Cycling is slightly riskier than driving, but for every day that you're statistically losing in life expectancy, you're gaining 9 days thanks to better health and less stress. When you bike, you feel better mentally. Cycling as Medication, is the title of a booklet that the Fietsersbond has published. Don't take Prozac! Just go for a half-hour bike ride every day. That works just as well!